Oasys is now the name given to Korg's monster $8000+ workstation keyboard. It was first released as a PCI card, though there was apparently a keyboard version in Korg's labs from early on. 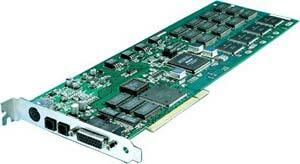 The card is essentially a 1212io audio card with a bunch of general purpose DSPs grafted on. The software would then allow you to load any number of synthesizer programs into the DSPs. The load on the host system was minimal, and because Korg had a long established history of synth design, I found the Oasys synths sounded way better, just in terms of sonic depth, as the other soft synths of the time. The Oasys seemed to be like a internal development board, because some of the synth programs were also found in Korg's hard synths like the Prophecy, Z1, and others. The Korg software allowed you to modify paramaters of pre-existing synths, but not create synths from scratch. There was some internal development software called SynthKit for MacOS 8/9 that was Korg internal developmet software that they made avalible on a limited basis, though few people outside Korg have made decent, useful instruments available. The user community was stymied when Korg refused to update the software for OSX and the new WinXP driver model. To me this stemmed from a synth maker not understanding the expectations of the PC market. You don't have to continually update a hardware synth to work with Microsoft or Apple. MIDI ports and 1/4" audio jacks have remained standard for 20 years. Most users still using the card have installed it in an older computer dedicated to only the Oasys. This works, but negates the benefit of having the sound card and synth in the center of your DAW. Mine is installed in the Blue & White G3, and I've found a few other uses for the machine, mostly running old Patch editor software for my VL1.